There is a really great and wonderfully civil discussion going on in the forums about Turtling (Gamara) & Excommunication and the going rogue – eliminate all your opponents/capture Pandemonium – end game strategy. For no logical reason I always imagined that the the Victory conditions at the end of a game would have a distribution of something like 70% Prestige winner, 13% Pandemonium Usurper, 13% Eliminate everybody with the killer turtle and the remaining 4% some variation of Kingmaker or Power Behind the Throne which I guess is a prestige type victory. But anyway, I really wanted to push all the game theory nightmares of cooperation and defection with an environment that had a huge amount of uncertainty so that you would get exciting shifts in the balance of power and perceptions of who was your friend (always of convenience) and foe (there can only be one King of Hell). 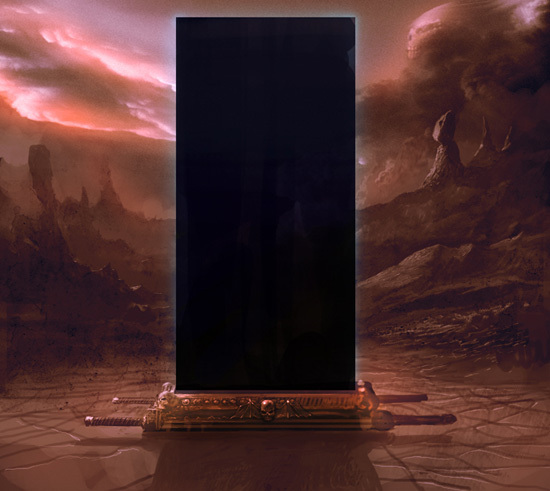 The Archfiend who controls this relic has a +10% chance of receiving a Curse of Wrath manuscript any time a battle is fought in Hell. When placed in an attachment slot of a Place of Power(including Stronghold), that Place of Power can never be captured by an opponent. The second is via the purchase of two new legions that can appear in the bazaar. Both are styled as “Guards” and contain the following special ability. So a player facing the late game gone rogue excommunicated Gamara sized turtle who is rolling the dice for a bid to take it all might find a way to throw a monkey wrench into the works. I don’t want to discourage Gamara mind you. I always envisioned that as an acceptable strategy….high risk if not executed well was the accent I was trying to give it but a viable option. Excommunication cuts you off from the Infernal Bazaar which I wanted to be the equivalent of burning your ships on some desolate coast and heading inland. I had originally thought about prohibiting rituals as well but decided against it as it closed down the operating scope of Gamara’s choices too severely. That said Gamara should feel that time is his enemy. So I’ve added this new rule to the Rectification rule set. If a player is excommunicated, any time that he requests tribute, there is a chance that the tribute will not be delivered. The chance is 50% minus 5% for each level the Archfiend has achieved in the Diabolism discipline (power). 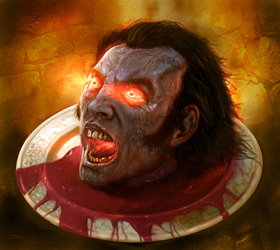 Membership in the Infernal Conclave conveys certain advantages after all and the timely delivery of tribute is one of them. I like coming up with fun elements/mechanics that can really throw a monkey wrench into another players well crafted plans. The best ones are very specific in defining the conditions under which they are advantageous. The stars have to be right to get the maximum value for the mechanic in question. Maybe I feel that way because despite my profound disavowal of the God of Balance, I still secretly kneel before the alter from time to time? I’ve been wanting to write a ground breaking treatise exposing the false god for some time but that will have to wait for another day. Anyway, here is an Unholy Relic that you will find in the Solium Infernum: Rectification mini expansion update. The Archfiend who controls this relic gains the ability to perform the Hell Sculpt ritual. The relic must be placed in a ritual slot inside the ritual chamber in order for the ritual to become available for use. Select a valid target Canton that does not contain a legion or Place of Power and change the terrain type to a different terrain type. That’s the title. I’ve been working on a free mini expansion pack for Solium Infernum. It’s in pretty good shape at this point and I hope to have it available in a beta form by the end of the month for adventurous players who would like to give it a go for a few weeks to find bugs and give me some game play feedback for tweaking the new mechanics. The good news is that ongoing games should not be affected by the expansion pack. At least that’s what I have been able to engineer for now. Lava Fields Terrain – any legion defending in a Lava Field Canton gets a +1/2/3 bonus (depending on the legions level) in a random challenge phase during the battle i.e. Ranged, Melee or Infernal. The bonus appears like a Combat Card bonus. Use this action to lodge an Assertion of Weakness against your opponent in front of the Conclave. You will be required to wager prestige and designate a Canton that you will seize from your opponent and hold for a certain number of turns. Your opponent must reclaim the Canton or lose it and prestige equal to that which you wagered. If you keep the Canton until the end of the designated turn then you gain it and the prestige your opponent lost. Prerequisite: You must have forced your target opponent to have accepted at least one insult before this option will appear. A Vendetta or a claim of an Assertion of Weakness resets the existing Insult requirement. New Manuscripts: Curses — These are acquired by possessing new Unholy Relics. 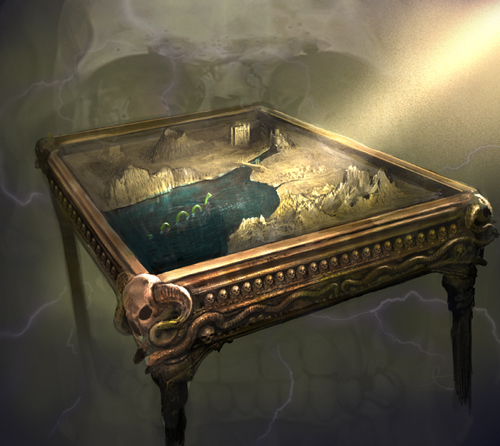 The Relics have special abilities that are triggered by game situations that yield the possibility of a curse manuscript being created for your use. There are 5 curses that can be invoked. You are currently browsing the Forgotten Lore blog archives for September, 2011.